Once you choose one of the buttons below that best describes the way you would like to enjoy this sweet little book, all you need to do is tap that button and Shazam~you will receive it! You will never be asked for any monies, email address, your name, or to sign in. 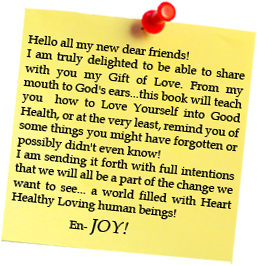 This is truly a “no strings attached” gift sent through me to YOU from the universe….with love. If you choose to create a book club to further your personal growth and to share it with 10 women or more that you know, for sure, the angels and I will be applauding your actions and literally jumping with….JOY! ePUB ebook – suitable for all e-readers except Kindle including Kobo, Sony, Nook, etc. Intrested in knowing more about Joy?